· What is the Third Party Publishing policy for BASH! ? 1. The Product will need some language that says that it requires BASH! UE to play- this means that you cannot just reprint the BASH! UE rules inside your product- you can reference the rules, but not reprint them wholesale. 2. The Product will need to carry a logo on the front that indicates that it is for use with BASH! UE. Please see Point 4! 3. Each product would need to be submitted for approval to Basic Action Games. This would be to protect the BASH brand from being associated with inappropriate stuff, makes sure the product meets quality standards, and also to keep two publishers from making the same product, or from making a product Basic Action Games was already making. The first step would be the initial proposal for a third party product, and once that is given the green light, you will also need to submit the completed product for review for the final greenlight. Once the final greenlight is given, you can publish and sell your product. This policy will eventually be translated into Legalese in the form of a contract, and may be updated; but in the meantime it will operate on good-faith and mutual agreement between the third party and Basic Action Games. Basic Action Games will not demand a share of the profits from this project. If it is your work, and you put up the capital for the artwork, layout, etc, then the profit is yours! If you want to collaborate with Basic Action Games on a project, and plan to share costs/profits, we're open to that as well. 4. Here are the current compatibility logos. 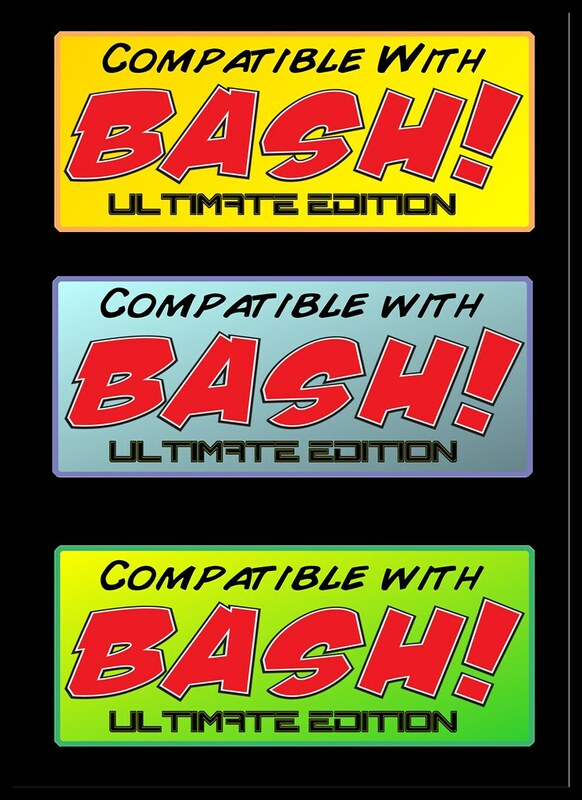 As you can see, you've got a choice of 3 colors, that way you can pick the one that most compliments your cover for your approved BASH! UE project.